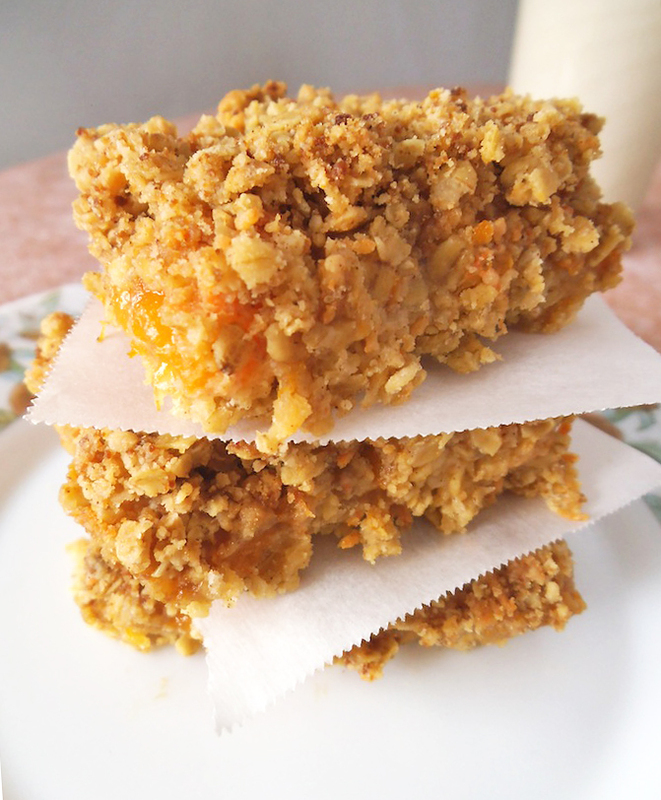 Made with simple pantry ingredients, these oat bars and their peachy goodness are entirely within reach all year round! Finding a juicy fresh peach is not an easy thing. Last summer we struck out and were disappointed with the peaches available; I have craved good peaches ever since. Thankfully, canned and frozen peaches make it possible to taste one of my favourite fruits any time of year. Summery peaches bring the hope of sunshine to come. Warm weather may still be months away, but ginger, nutmeg and cinnamon are aromatic pick-me-ups. Colour is also something my eyes long for as the cold lingers on, which the peaches and carrot cheerfully offer (along with Vitamin A). While I have yet to master the art of carrot cake, I love adding carrots to all sorts of things, like granola and hot cross buns. The flavour is such a subtle accent that you probably won’t notice the carrot, which allows the peaches to take center stage. These versatile bars work well as an afternoon snack or a simple dessert. Or follow my lead and save some for breakfast! Whisk together oats, flour, sugar, baking powder, salt, and spiced. In a separate bowl, blend together coconut oil (or butter) and grated carrot, and then stir in vanilla. Add carrot mixture to dry ingredients. Use a fork and/or your fingertips to break apart the larger pieces and mix well, until even crumbles are formed. Line the bottom of a 8-by-11-inch (20 cm x 28 cm) or 9-by-9-inch (22cm) square dish with baking parchment. Press about two-thirds of the crumb mixture into the dish. Bake at 350 degrees F (180 C) for 15 minutes or until light golden. To make the filling, combine diced peaches with cornstarch in a medium saucepan. Stir well and mash peaches lightly with a fork. Add maple syrup or honey and sugar. Turn on heat to medium low and bring to a gentle boil, stirring frequently. Simmer and stir until thickened juice turns clear. Remove filling from heat and stir in 1/8 teaspoon vanilla. Remove baking dish with oat base from oven to cool slightly. 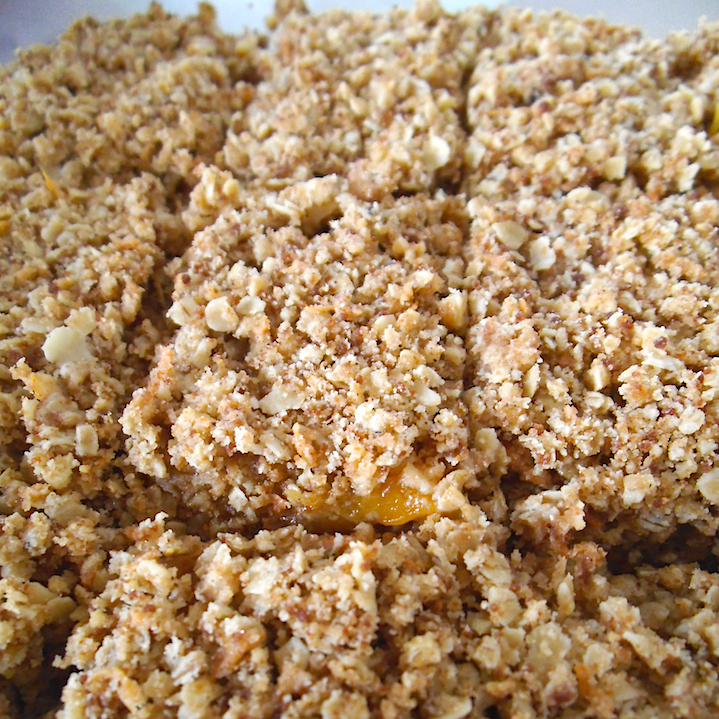 Spread peach filling over the oat crust. Top with remaining crumb mixture. Bake at 375 degrees F (190 C) for 20 minutes or until topping is golden brown. Allow the pan to cool completely before cutting into bars. Also shared at Natural Family Fridays and Savoring Saturdays. These look fantastically delicious! 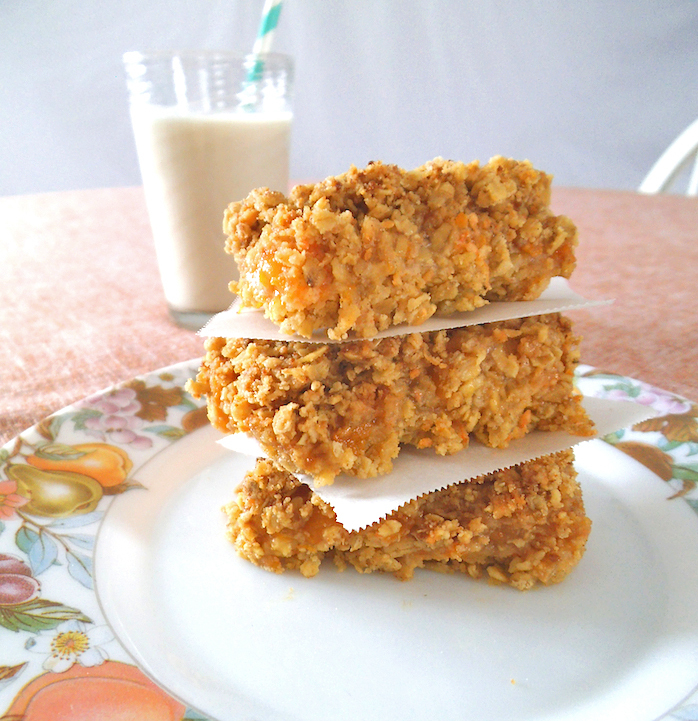 I’m glad that canned peaches work just fine in this recipe…I don’t think I can wait until summer to try these! Oh my these look amazing. I have to try and make these. My daughter and her friend wanted seconds. Hope you enjoy them too!